Critical operations require critical care, and a provider equipped to provide a high quality rapid response. Available exclusively through our global network of Gardner Denver Nash manufacturing, service, and distribution centers, GARO OEM Service & Support is there for you when downtime is not an option. When the Flare Gas Recovery unit at a Houston area refinery went down, NASH / GARO OEM Service & Support responded. Providing rapid response, engineers at NASH / GARO’s state of the art service center were able to provide a complete compressor remanufacture in just 3 days. When downtime is not an option, you need a partner that you can trust. GARO OEM Service & Support, available exclusively through our global network of Gardner Denver Nash manufacturing, service and distribution centers, is there for you. 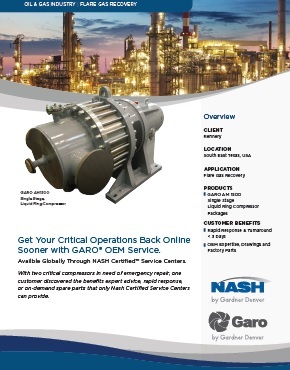 Fill out the form to download the case study, and find out how NASH / GARO OEM Service & Support can help keep your critical operations running.